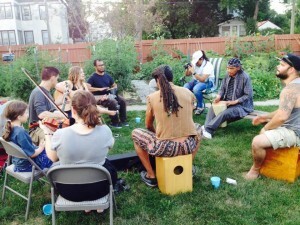 The Gandhi Mahal Interfaith Garden is a collaborative project with Minnesota Interfaith Power & Light(MNIPL), Gandhi Mahal Restaurant, All Saints Episcopal Indian Mission, and New City Church. Gandhi Mahal started this backyard garden in 2012 as a pilot project with HECUA, providing local, sustainably-grown food for the restaurant. The garden is a part of a bigger network of farms and of the economic system of Gandhi Mahal, showcasing their commitment to building sustainable communities and increasing the food security of our neighborhoods. Check out what Gandhi Mahal has done over the years! 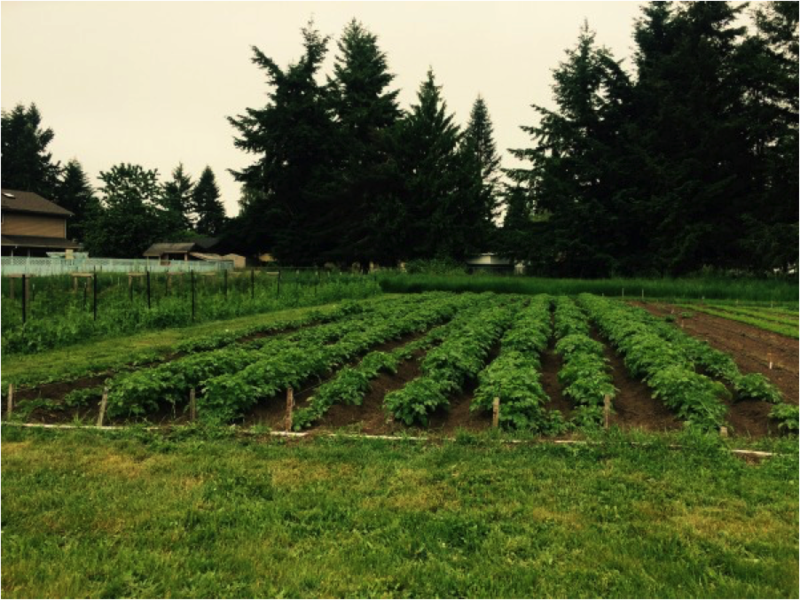 This year MNIPL is leading this collaborative urban farm program to explore the connections between food, faith, and climate change. They are growing crops that become an assortment of traditional Bangladeshi/Indian dishes at Gandhi Mahal, as well as supply the healthy, traditional indigenous ingredients for free community meals prepared at First Nations Kitchen every Sunday night, a ministry of All Saints Episcopal Indian Mission. Open Garden Nights were every Sunday throughout the summer. 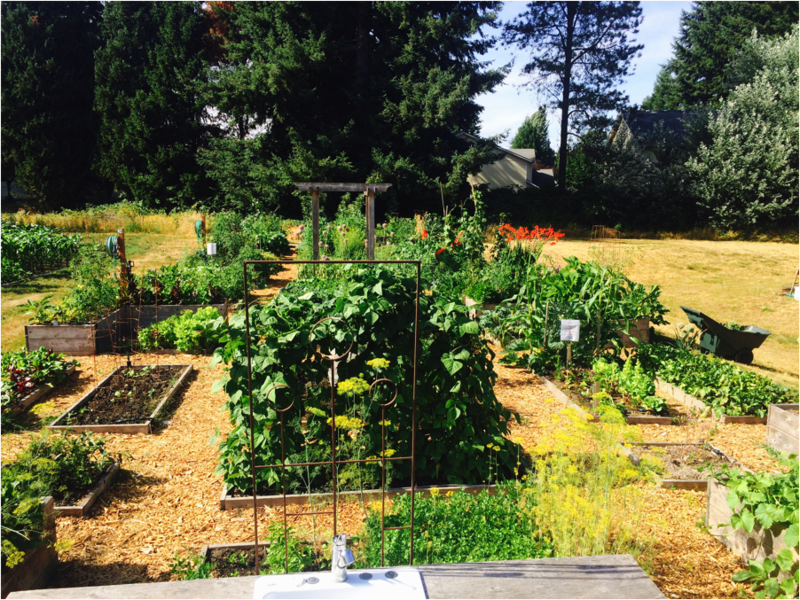 The garden serves as a radically welcoming, open space for folks from community dinner at First Nations Kitchen and neighbors to spend time at the garden. 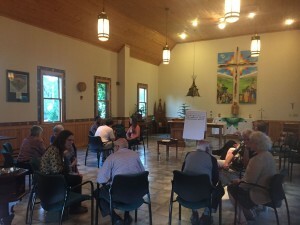 In June they hosted an incredible Interfaith Climate Conversation, making the connection between climate change and agriculture through their Climate Conversations model, participants spoke from Muslim, Baha’i, Christian faith backgrounds about their connection to food. This event fell during Ramadan, so afterward everyone shared in a community Iftar to break fast together, hosted at Gandhi Mahal. St. Mark Evangelical Lutheran Church of Lacey, Washington entered the 2015 Cool Congregations Challenge with their Community Garden. Their church had slightly over an acre of land that had been fallow and unused for years. One of their church members really wanted to instill a love of the planet into the Sunday School kids so they started vegetable seedlings and planted them in the back lot. A small group was formed in 2011 from the church and many skeptical members watched from the sidelines (“How are they going to do an ORGANIC garden?”) Kiwanis of Olympia had three large Food Bank gardens and they helped the church set up low pressure irrigation that irrigated just the crops, they supplied them with seed potatoes for 2000 row feet, explained how to harvest, and supplied some equipment. A core group of volunteers worked very hard in 2011, & 2012 to weed and maintain the garden and at the end of the second summer the skeptical members were very impressed! Their ranks of volunteers and monetary supporters continues to grow. They are fully pesticide free, and all organic. What started as a Sunday School class planting veggie starts is now a well established Community Garden with 46 raised beds offered free to community members (drip irrigation included) each growing season, and over an acre of cultivated land which grew 9100 pounds of produce for the Thurston County Food Bank. This brings our total since 2010 to 33,600 pounds. They believe others find inspiration in this project from the diverse partnerships that have been formed. 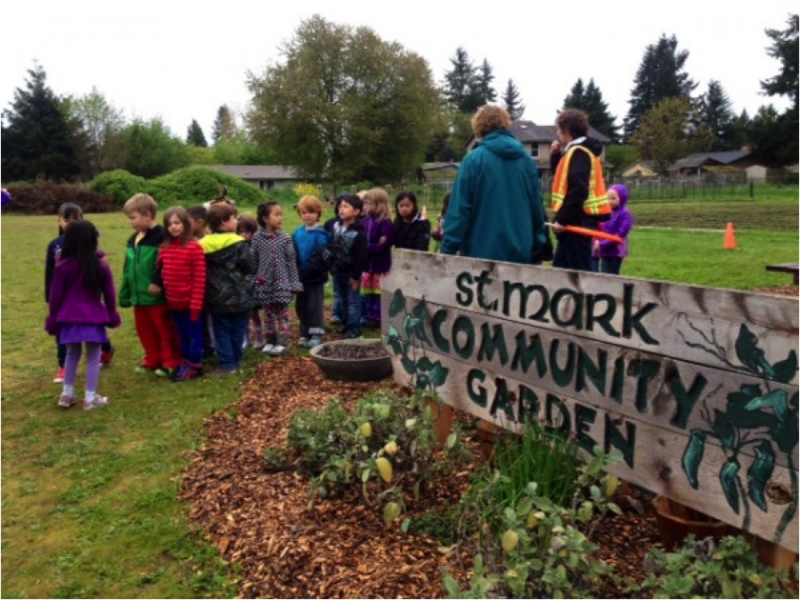 Today they have a vibrant, community-based, environmentally sensitive garden where learning, relationship building, fun, and very hard work all come together. Lacey Parks and Recreation dept. advertises their free raised beds and we have many more community members than church members using their raised beds and helping in the Food Bank garden. Mountain View Elementary, a large elementary school across the street, working with the Food Bank educator, sent 22 field trips for a total of 700 children to the garden this past spring to plant veggie starts and seeds, identify and taste fresh veggies, and have a healthy snack . The children were ecstatic to plant, grow and harvest vegetables, as well as learn how vegetables can not only be weird and beautiful, but also nutritious for the body. Several kids stated that “This is the BEST field trip ever!” GOD’S work, OUR Hands. Komachin middle school science department grew broccoli and cabbage starts for them as part of their science curriculum. Cooking classes, provided by a grant, were also provided to all classes by Food Bank educator and their members using garden produce and other food. St. Mark Evangelical Lutheran Church entered this project into the Cool Congregations Challenge. If you have a great project going on at your congregation enter it into the 2016 challenge an you could win your congregation $1,000!